ARLINGTON, Va. (CNS) — Bishop Michael F. Burbidge said that during these unsettling times, Catholics must imitate the witness of St. Thomas More by bringing the joy of the Gospel to the public arena with conviction and love. The bishop was installed as Arlington’s fourth bishop Dec. 6, the feast of St. Nicholas, at the Cathedral of St. Thomas More. He succeeds Bishop Paul S. Loverde, who retired after heading the Arlington Diocese for 17 years. Bishop Burbidge said there’s often a price to pay when we refuse to compromise our faith. In his homily, Bishop Burbidge reflected on the close bond that his family has with St. Thomas More, the patron saint of the Arlington Diocese. The bishop’s father, Francis, was a graduate of St. Thomas More High School in Philadelphia, where he was challenged daily to imitate the courageous witness of the saint. The school closed in 1975, but the spirit of the alumni remains strong, Bishop Burbidge said. “Their motto, which appears on license plates, and banners and other items, is respectful and very dear to their heart: St. Tommy More Forevermore,” he said. Bishop Burbidge said his mother, Shirley, spent the last year of her life in an assisted-living facility run by the Sisters of St. Joseph. “She made a new friend, and each and every day, they would help each other down the hall, take the elevator, and go down to the gift store, and they would buy a gift — a trinket, an ornament, a stuffed animal — only to give it away to another resident or to a family member,” he said. “I think that is a beautiful image for all of us: In the midst of the trials, and struggles, and crosses in our lives, God is there, bestowing gifts to us to behold,” he said. “And on this joyful day in the life of our diocese, I am aware of the many gifts for which I must be thankful,” the bishop said. “I’m so thankful to the Holy Father Pope Francis for assigning me to this faith-filled and vibrant diocese. 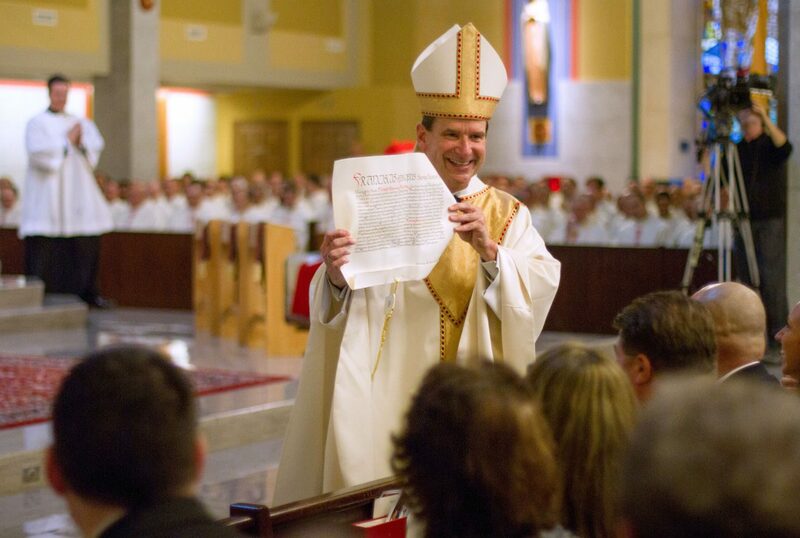 Bishop Burbidge, who was named to Arlington Oct. 4 after 10 years as the bishop of Raleigh, North Carolina, recognized the generous service of his predecessors in the Northern Virginia diocese — Bishops Thomas J. Welsh and John R. Keating. He thanked Bishop Loverde for “the gift that you have been and always will be to our diocese. Jesus sent his disciples in the company of one another to proclaim the good news and he instructed them not to take anything that would weigh them down — in other words, to travel lightly, the bishop said. “May we imitate the courageous and faithful example of St. Thomas More forevermore, with the strength that God supplies, so that, together, we may walk humbly with our God and travel lightly today and always,” he said. The installation Mass began when Bishop Burbidge knocked on the cathedral door and was welcomed by Father Robert J. Rippy, cathedral rector and a seminary classmate of Bishop Burbidge, who presented him with a crucifix for veneration. Archbishop William E. Lori of Baltimore was the installing prelate. Archbishop Christophe Pierre, apostolic nuncio to the United States, read the apostolic letter on the new bishop’s appointment from Pope Francis. Archbishop Pierre said Pope Francis recites the prayer of St. Thomas More on a daily basis. The nuncio called Bishop Loverde an apostle who has shared the joy of the Gospel with the church in Arlington. “Bless you in the years ahead,” the archbishop said. He then gave the apostolic letter to Bishop Burbidge, who presented it to the congregation and the College of Consultors. The two archbishops then escorted Bishop Burbidge to the cathedra, or bishop’s chair, where he received his crosier. Msgr. Frank E. Mahler and Father Colin P. Davis represented diocesan priests as they greeted Bishop Burbidge. Supreme Court Justices Samuel Alito and Anthony Kennedy were among the dignitaries in attendance, along with Washington Cardinal Donald W. Wuerl, Cardinal Justin Rigali, retired archbishop of Philadelphia, and Cardinal Theodore E. McCarrick, retired archbishop of Washington. Diocesan, ecumenical and interfaith representatives greeted Bishop Burbidge. The prayers of the faithful were read in Spanish, Vietnamese, Ghanaian, Korean, Tagalog and English. Flach is editor of the Arlington Catholic Herald, newspaper of the Diocese of Arlington. May Our Father in Heaven continue to bless you as you step forward on the journey, He has set before you. Hopefully, I’ll live to see the day, you are installed as Cardinal and be named as a candidate for the first Pope from North America.